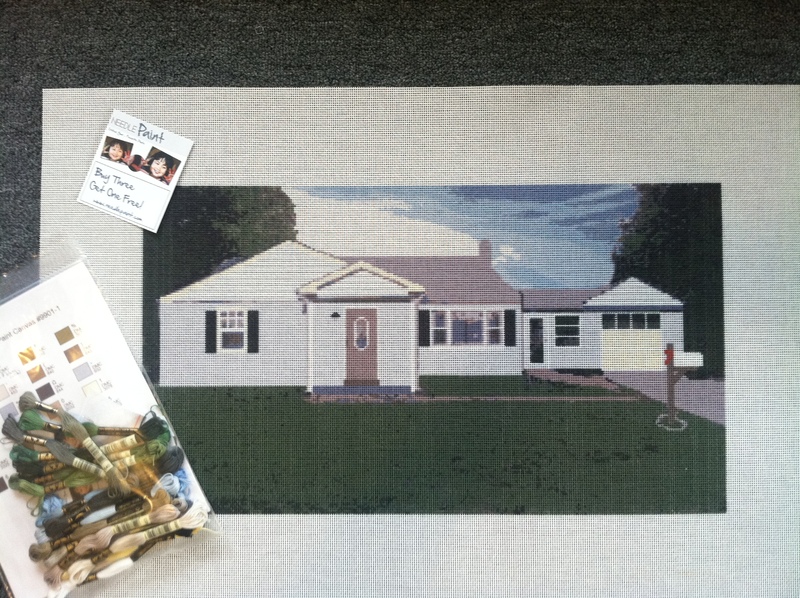 Last week we designed and made a needlepoint kit for a stitcher who’s son recently purchased a new home. The size she wanted to stitch was 23 inches by 13 inches. 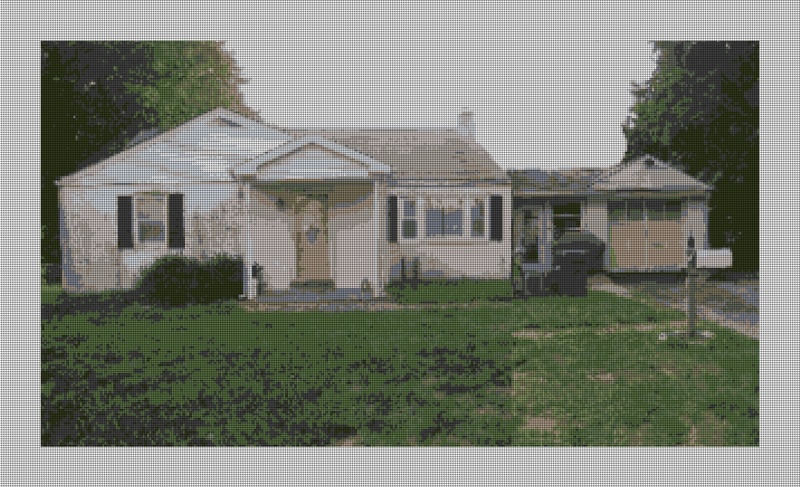 The tricky part was that she could not get the two doors of the house to show up in the same image. She emailed me 4 images, and I took two of the angles that I thought would work, and stitched them together. 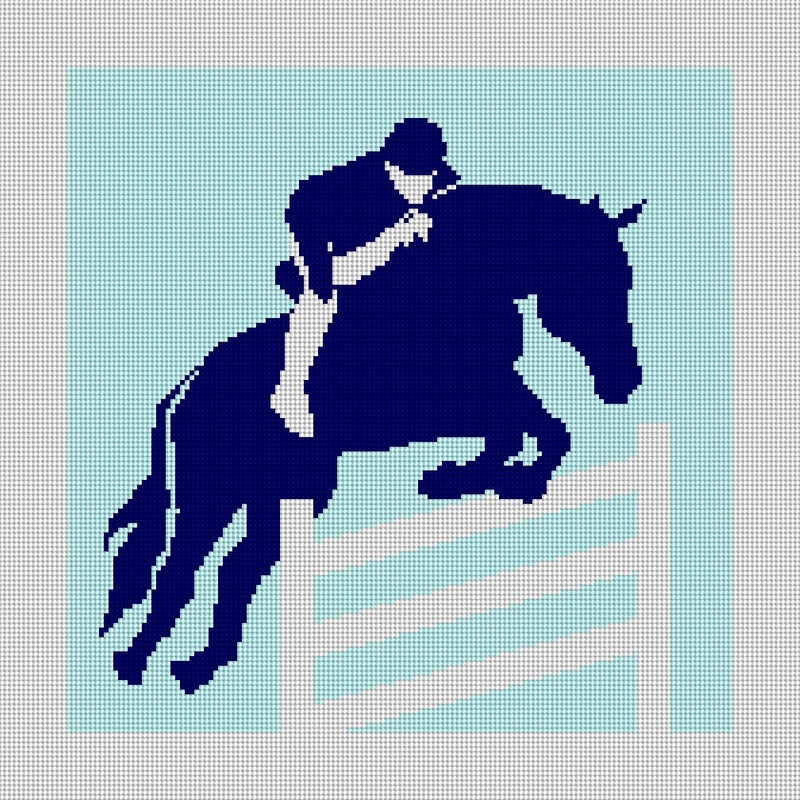 Even if your needlepoint photo is not perfect, if you contact us, we can probably help! Visit our website NeedlePaint.com to get our phone number and email address. We worked on two more needlepoint belt projects, and they came out really well. We’ve titled these Whisky and Gunpowder and Air School. I can’t wait to see them finished! 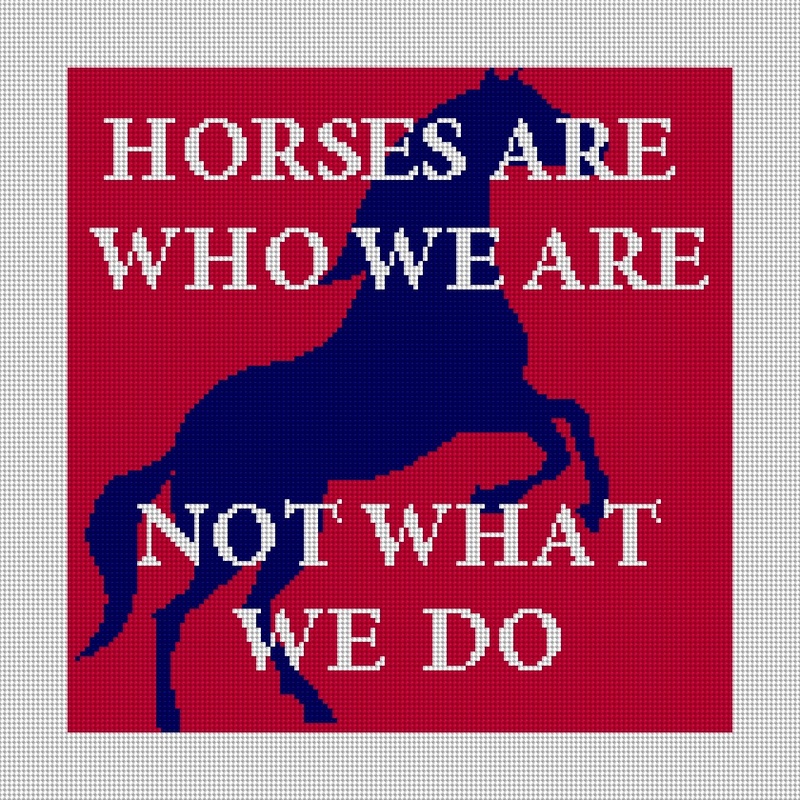 You will also notice that we added a new section to our Personalized Needlepoint Shop. Below these images is a description from our press announcement which explains our process in a little more detail. 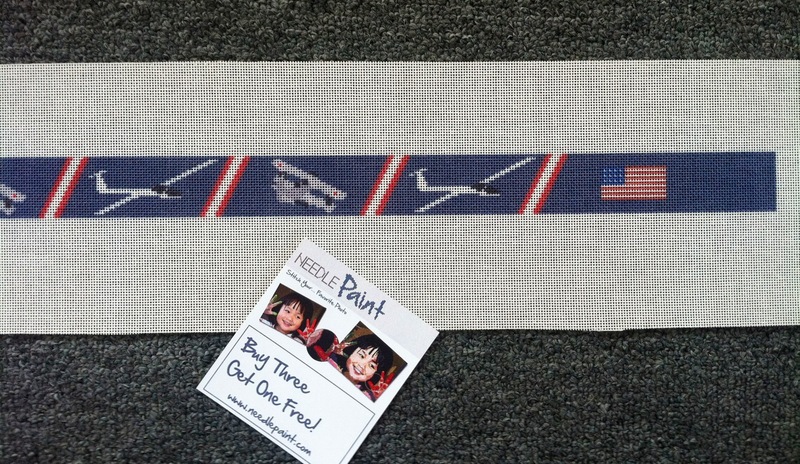 This week NeedlePaint.com has launched a new needlepoint belt web page. Needlepoint belts have long been a favorite for men and women who love traditional style belts. NeedlePaint is taking this a step further by allowing stitchers to create their own custom style for their belts. The new web page features exclusive designs that can incorporate space for a custom monogram. Customers can also request color changes and even design element changes. Starting out with 3 new designs, there are many more in the works. 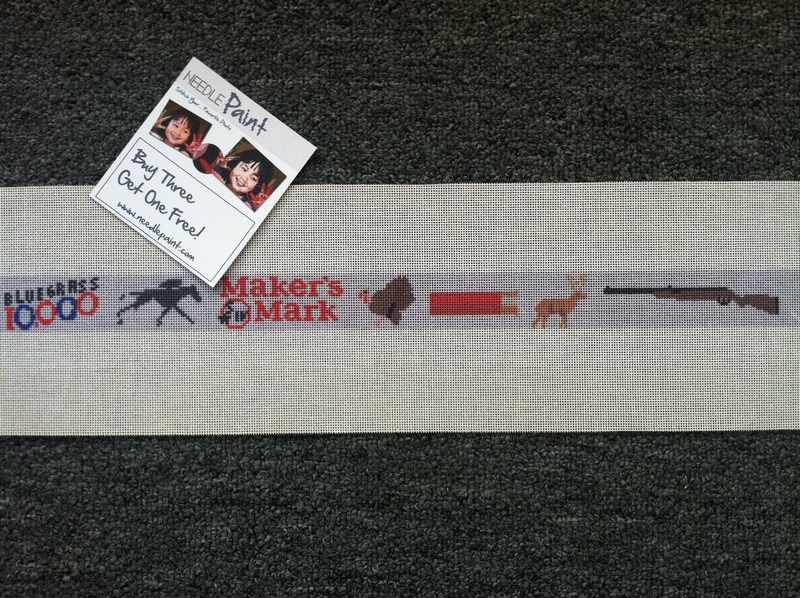 The belt canvases are also available as needlepoint kits which come with matched DMC floss. The needlepoint canvases are typically designed on 18 mesh canvas. 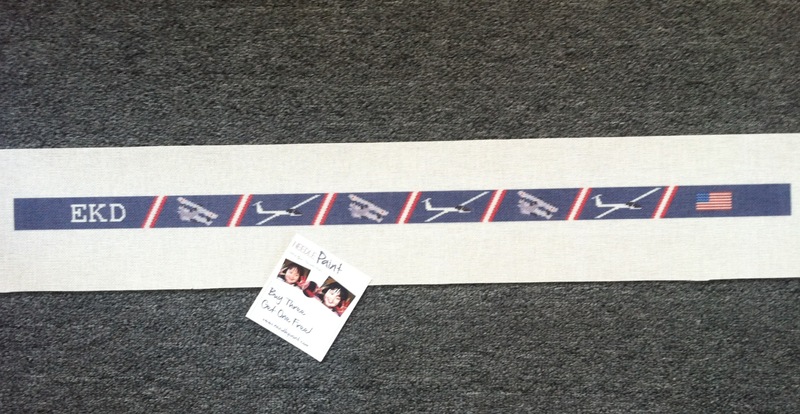 If you have an idea for a belt, please contact NeedlePaint and they will be happy to help design your own custom needlepoint belt. Belt canvases start at $51.25 and all customers will be given a digital preview for approval before their canvases are made. Often people ask what size their needlepoint canvas should be for their project. We recommend sizes that are commonly available in stores as picture frames. This project was one of them, and the customer created needlepoint designs to fit in 8 x 10 inch picture frames. 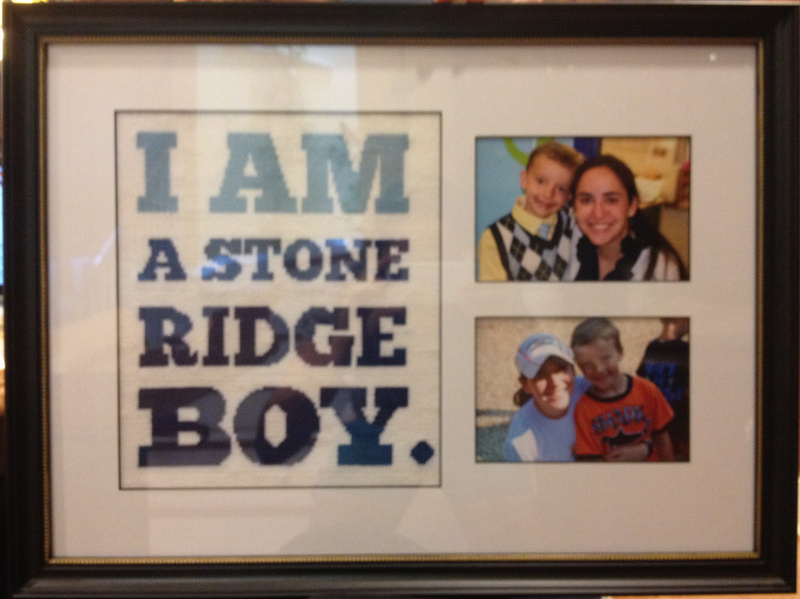 We shipped two custom needlepoint kits to her, and what I really love, is how she used a multiple image frame for the one with her boy The second photo has less reflection and show her needlepoint much better. 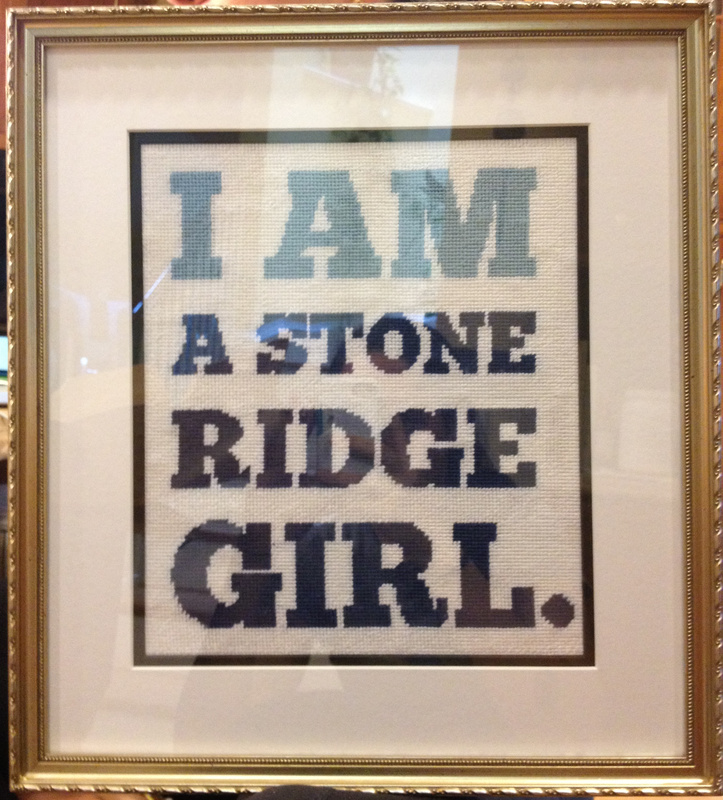 Simple custom needlepoint designs look great! The Multiple Image Frame for Needlepoint – Looks Great!!! Simple Needlepoint Designs Look Great! JoAnn Fabrics and Michael’s Crafts both carry large selections of affordable frames that can be used for your needlepoint projects. 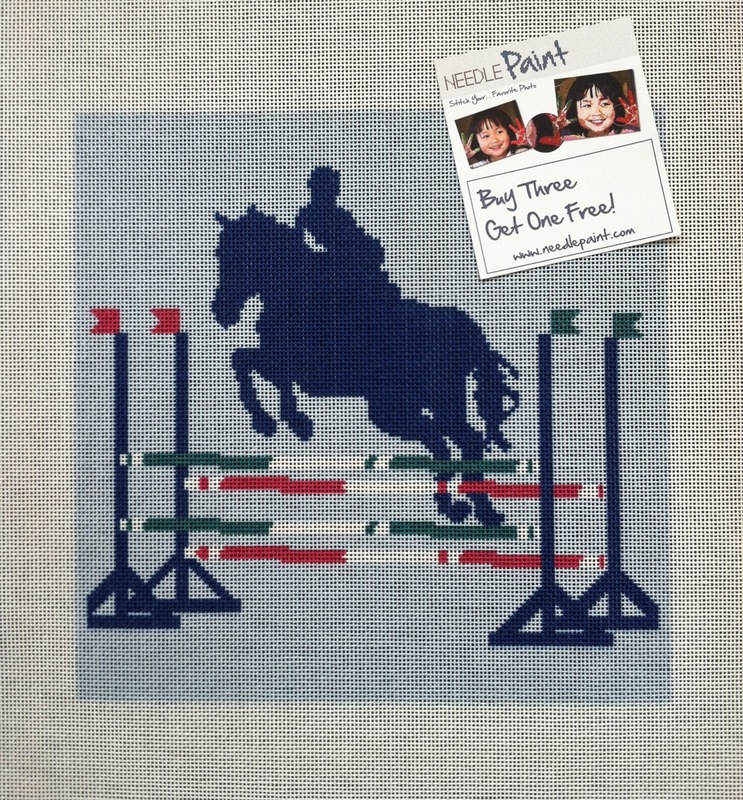 For more needlepoint framing information, go to Janet Perry’s needlepoint framing post. 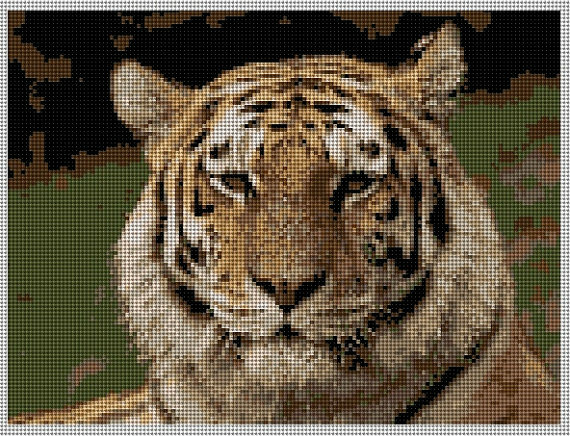 A while back, a customer contacted us about our tiger needlepoint canvas that we sell on etsy (look at our “animal” needlepoint section). They loved the design, but prefer work on 12 mesh and wanted a much larger design to make a needlepoint pillow. 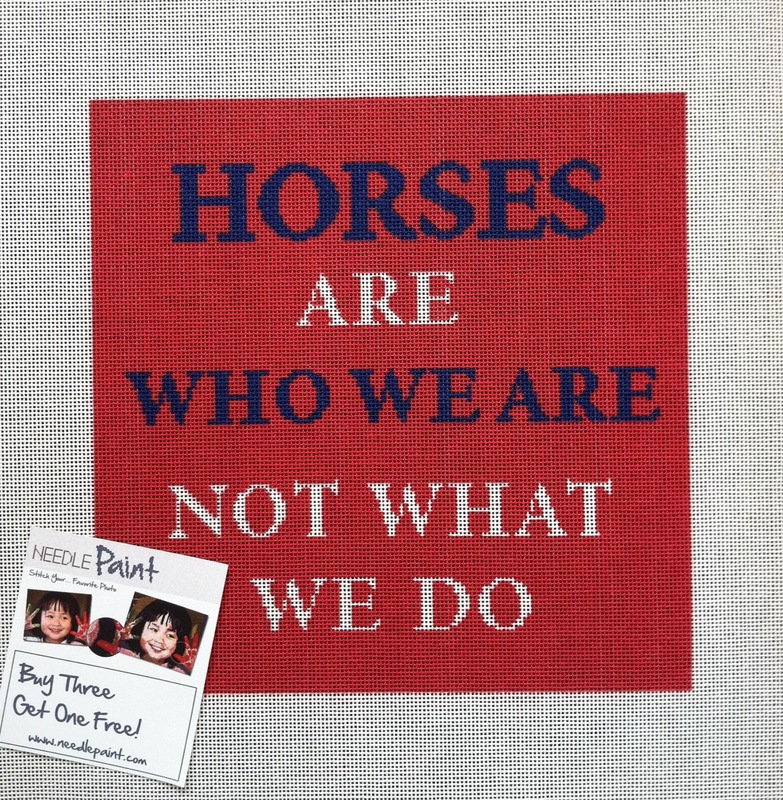 We ended up making a 15 inch wide by 11.25 inch high custom needlepoint canvas. Since the customer prefers to stitch with wool, we included 1 skein of each color matched to the original photo, to help her purchase the correct colors from her local shop. Really, this blog is about the stitching, not the words, so check out her work! 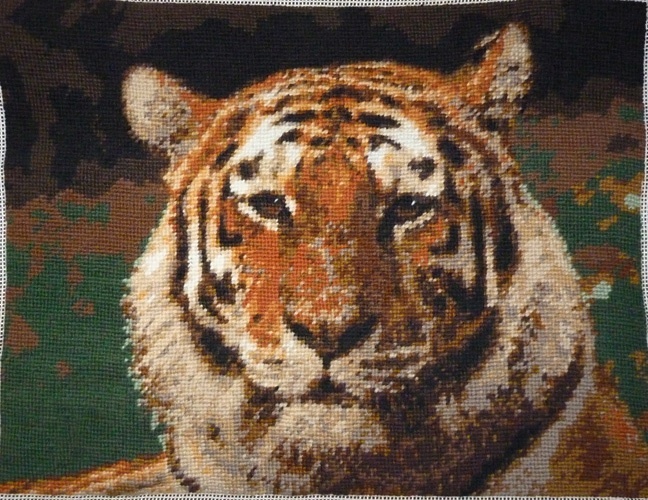 This is the preview of needlepoint design on 18 mesh canvas, a photo needlepoint project that comes out beautifully. Thanks for the pics and your great stitching Joanne!!! Please note, we do often adjust color palates to match animals better, so if you notice any colors you want adjusted with a design you are thinking about ordering, just let us know and we’ll be sure we make them. 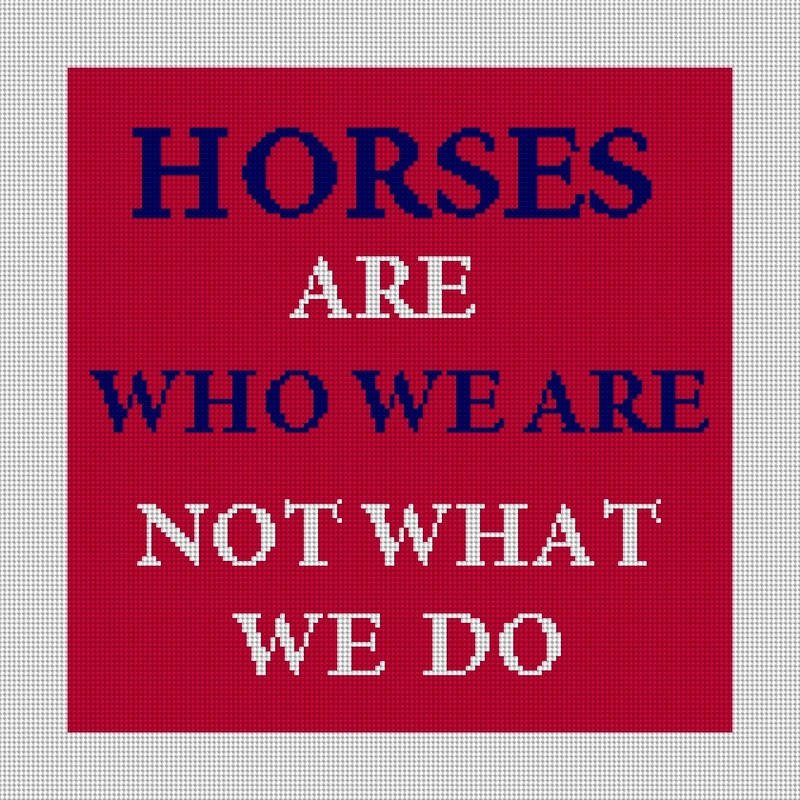 We were recently contacted by a horse lover to help her design needlepoint pillows for her house. Well, she was actually only looking to buy one pillow, but she liked both designs so much, we ended up doing two needlepoint canvases! That, and she was looking for a clean “Ralph Lauren” feeling design. Below are two options we emailed to her. The second attempt took more skill in the digital design, using photoshop. But, this one came out perfect. 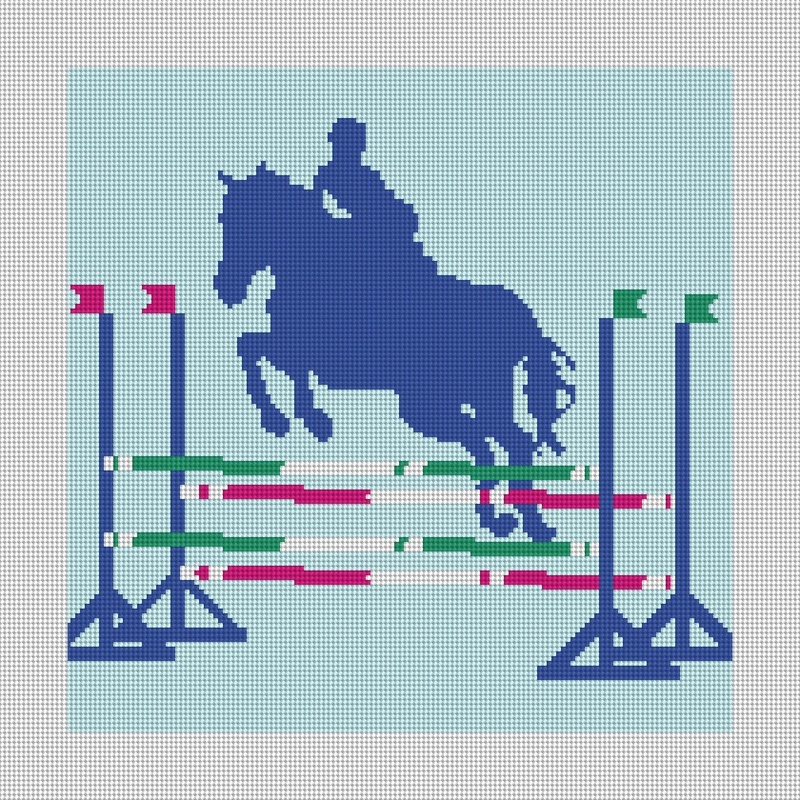 The best part of the project is that I was watching the Olympics equestrian team jumping and knew exactly what they were talking about! The horses are amazing! The canvases came out so well, I wanted to be sure you got see them. Also note, that we added an extra 3 stitches around the sides so when this gets turned into a pillow, the design will not be cropped. ***If you are interested in buying a custom needlepoint pillow but don’t stitch, please contact us! We have great prices on finished pillows, but are also happy to help beginner stitchers learn.